This triangle area calculator can help in determining the triangle area. The basic triangle area formula needs to have a base and height given, but what if we don't have it? How can we calculate the area of a triangle with 3 sides only? The triangle area calculator is here for you, give it a go! If you are still unsure how to find the area of a triangle, check the description below. area = 0.5 * b * h, where b is the length of the base of the triangle, and h is the height/altitude of the triangle. If you are looking for other formulas or calculators connected with triangle, check out this right triangle calculator, pythagorean theorem calculator and law of cosines calculator. Enter the second triangle side. Let's choose 5 in. Determine the angle between two known sides. For example, 30 degrees. 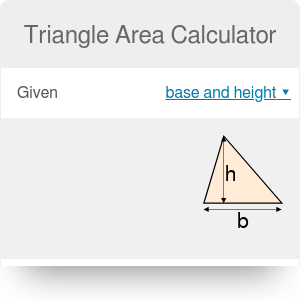 Watch our triangle area calculator performing all calculations for you! The area for our case is equal to 11.25 in². Although we didn't make a separate calculator for the equilateral triangle area, you can quickly calculate it in this triangle area calculator. Simply use the subpart for the area of a triangle with 3 sides - as you know that every side has the same length in an equilateral triangle. It's possible to calculate that area also in angle-side-angle or side-angle-side version - probably you remember that every angle in the equilateral triangle is equal to 60 degrees (π/3 rad). Triangle Area Calculator can be embedded on your website to enrich the content you wrote and make it easier for your visitors to understand your message.